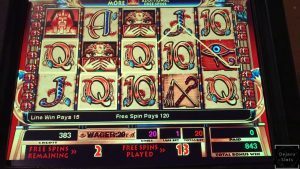 If you have been going to casinos for a while, you probably have spent a lot of time playing traditional slot machines, including Double Diamonds, Red, White & Blue, and others. In the twenty-first century, slot machines became a world of their own. There are machines and games of all kinds, flavors, shapes, and colors. There are literally hundreds of different designs, especially for the machines that have interactive screens. With some machines, you can even change the games without leaving your seat. Slot machines are really easy to play, which is one of the reasons why they are so popular. To win on most machines, all you need is to get identical symbols in one line. Most machines today accept both cash and electronic tickets. When you are done playing, the machine will not dispense cash. It will print a ticket with a current balance that you can take with you to other games in the casino. After you are done playing for the night, you can redeem the ticket at the cashier’s window and turn it into cash. This is a much simpler process compared to having to carry lots of coins with you and change coins into bills when you are done playing. Typically, you can play just one coin or credit, or you can play multiple credits, which means multiplying your wager. You need to understand that there is no benefit to you in multiplying the wager because the payout is strictly proportional to the wager. This means that hitting the cherries may pay $30 if you play one credit, $60 if you play two credits and $90 if you play three credits. A variation of the wager multiplier is the bonus multiplier. A bonus multiplier is different because it does pay more when you play more credits. It offers a bonus when you play the maximum allowed number of credits and win a jackpot. This type of machine usually encourages players to play as many coins as possible during one game.